Do you need to deck the halls in less than 0.9 seconds? 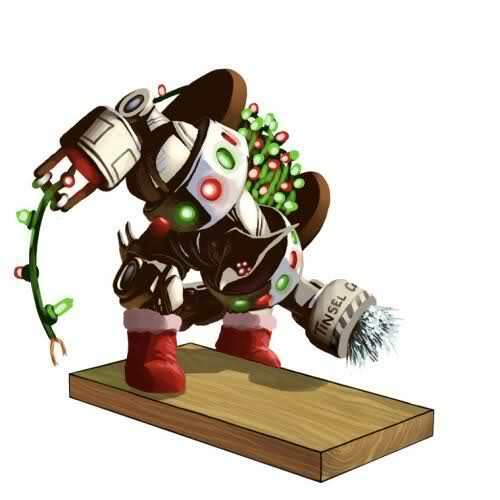 This trap skin adds a useful tinsel cannon and high-velocity light stringing spool to the Digby DrillBot, allowing a hunter to turn any room, location or mouse into an explosion of festive decoration! The Digby DecroBot Skin can be used on the Digby DrillBot. The trap's stats (power, power bonus, attraction bonus, etc.) are not changed. The Digby DecroBot Skin may be made available during the annual Great Winter Hunt event and can be traded on the Marketplace or through Give To Friends. 7 December 2011: The Digby DecroBot Skin was released at the start of the Great Winter Hunt 2011 event. It was available for purchase for 90 Ice Coins at the Festive Comet Trapsmith, requiring 425 Festive Toy Receipts. During the Great Winter Hunt 2013 event this skin could be acquired via Donation and could be found in a Festive Skin Pack. It was available for purchase for 70 Ice Coins at the Festive Snow Fort Trapsmith. This page was last edited on 9 December 2017, at 11:04.